ClassicBet is one of the newer Australian sports and racing betting sites to the Australian market, originally launching in 2014 under the owning ClassicBet brand. The site struggled to gain great traction in it’s first few years of operation but in April of 2018, it was announced that the ClassicBet brand, along with TopBetta and Draftstars, was purchased by international fantasy sports and online gambling company PlayUp. The takeover has breathed some new life into the ClassicBet brand, and as such we are happy to provide some more information in our full ClassicBet review below. 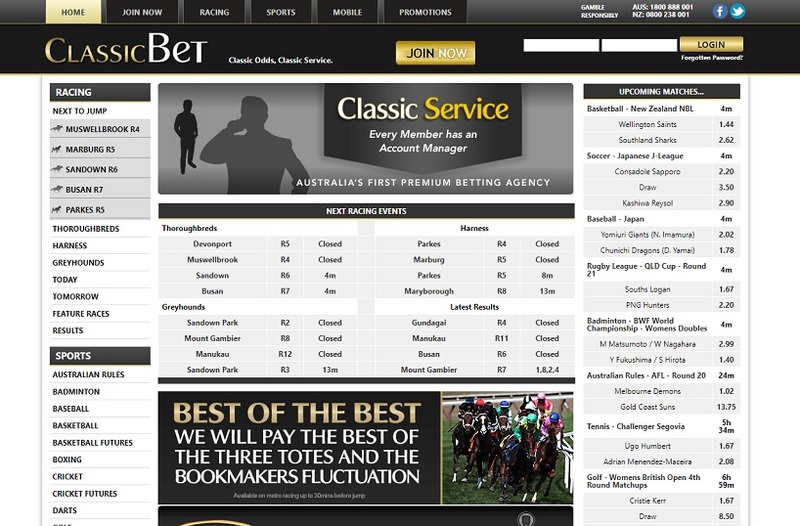 While many Australian betting agencies actually use the same design on their websites, ClassicBet have a completely original design that is easy to navigate and highly information based. The home page features some graphics of current promotions and links but all in all, if you’re a fan of no-frills betting than ClassicBet might be for you. Unfortunately, the website and the mobile app in particular can be a bit slow at times, unlike the smooth transitioning app of some of the larger sportsbooks. However, if that’s an issue you’re comfortable looking past, then ClassicBet provides some great features. The website uses a simple three panel system, where an extensive list of upcoming races and A-Z sports is shown on the left-hand side. Simply select any race/sport you want to view and the appropriate markets will show up in the middle panel. In the right-hand panel is a great live tracker list of upcoming sports with a countdown in minutes until their starting time. The right panel is also where your bet slip will show up once you have selected a market. All of the design specifications are quite standard in an Australian bookmaker, so what sets ClassicBet apart from the pack? It’s their customer service and marketing approach. ClassicBet claims to be ‘Australia’s first premium betting agency’, which might be a stretch, but what they are referring to is their above and beyond approach to customer service. Each customer at ClassicBet is aligned with a dedicated account manager, who will call or send text messages personally with any upcoming promotions or if you have any queries about your account, you’ll speak to your account manager directly rather than an operator. It’s a great personal touch that no other Aussie bookmaker offers. So instead of receiving your standard Friday evening text message from big betting agencies like CrownBet or Sportsbet that have been automatically distributed to every account holder, your ClassicBet account manager will send you a personal text that you can reply to if you need more info! When comparing it to some of the other, bigger agencies in Australia, the selection of sports markets leaves a little to be desired. If you’re happy betting on the major Australian codes (eg. AFL, NRL, A-League) and the big international leagues (eg. NBA, NFL, EPL) then you’ll have no problem finding markets. However, some of the markets on fringe leagues like the PGA, MLB and Cricket can be a little thin. ClassicBet offer tote and fixed odds betting on all Australian thoroughbred, harness and greyhound races along with a great selection of overseas races. They offer different tote products which range such as ‘best of best’, ‘best tote plus’, ‘middle tote’ and many more. ClassicBet offer a good range of depositing options including credit card, POLi, paysafecard, BPay and EFT transfers. 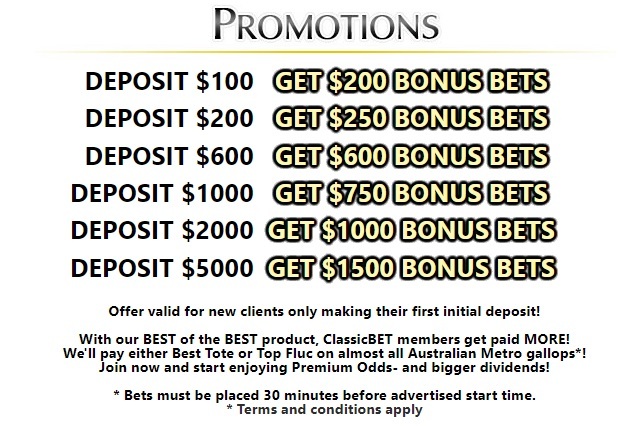 ClassicBet are extremely flexible with their initial sign up bonus to cater for all different types of punters. If you sign up for a ClassicBet account today through BYB and make your first deposits you can claim a number of different bonuses depending on your deposit amount! It used to be standard with ClassicBet that the bonuses could only be used on win/place racing markets, however, they have recently loosened that regulation to now allow you to place your bonuses on sports as well! This is a great range of betting bonuses, so be sure to click on the links here at Before You Bet and sign-up to ClassicBet today to start building your sports betting bankroll! Don’t forget to check out full terms and conditions on the ClassicBet website before signing up so that you understand fully how the bonus works!